Using the treatment-planned procedures that have been added to a case, you can present a treatment plan to a patient. On the Patient menu, under General, click (or tap) Overview. The patient's Overview page opens. The Treatment Plan box displays the patient's treatment plans. Click (or tap) a treatment plan. Skip step 1. 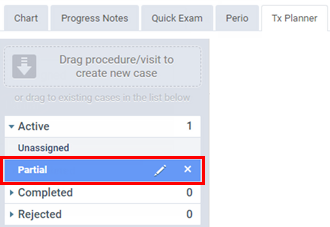 On the Tx Planner tab of a patient's clinical record, under Active, select a case. The procedures that belong to the selected case appear. By default, a presented case has a "Presented" status, but you can select a different status as needed. New - This is a newly created case that you have not presented to the patient yet. Presented - This is a case that you have presented to the patient. Accepted - The entire case has been accepted by the patient. Rejected - Any part of the case has been rejected by the patient. If there is a blue insurance plan icon next to the name of any of the patient's insurance plans, there is a note for that insurance plan. To view the note as a tooltip (only if you are using a mouse), position the pointer over the icon; otherwise, click (or tap) the icon. To view the details of the treatment plan's estimated guarantor portion, click (or tap) the amount next to Estimated guarantor portion. To print a copy of the treatment plan for the patient to take, click (or tap) Print. 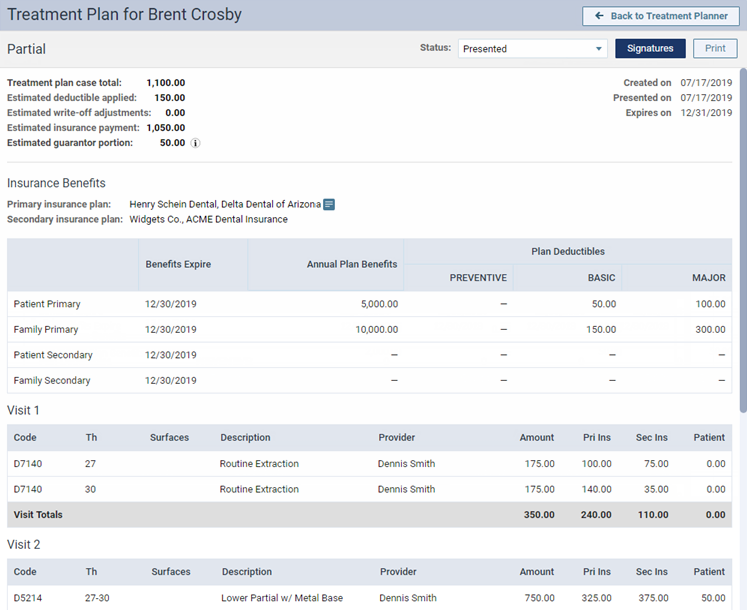 To return to the Treatment Planner page, click (or tap) Back to Treatment Planner. Is there a way to email treatment plans? Can you setup downgrades to show on the calculation on the treatment plan? You cannot. You can setup the downgrades for the insurance plan under the Coverage Tables, but that will not show on the calculations. This feature will be coming out in the future. Also, with the downgrading the procedures for the treatment plan, there is a function to override the insurance estimates manually on a single procedure at a time. For something to not be covered at all with insurance, set the insurance override at 0 (it will still show in unattached procedures though). Can we create multiple treatment plans in order to present patient with two different options?